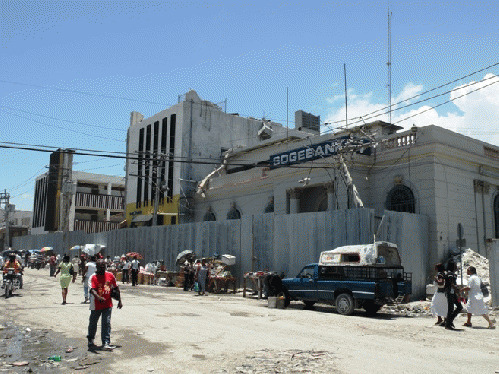 This downtown Port-au-Prince branch of Soge Bank, Haiti's largest commercial bank, took a big hit on January 12th. After we had returned from Bel Air to the Hotel Plaza on May 13th, our last day in Haiti, Georgianne had to take care of some journalistic duties while Andre told me that now was the time for him to give me his last Cook's Tour of earthquake destruction in downtown Port-au-prince, areas he, knowing his way around the capital so well, could get me to quickly and fairly easily by car and on foot. It was a sunny and already warm mid-morning, perfect weather for some good photography, so with my faithful Nikon P80 dangling around my neck and my old beat up straw hat on, we began the last hurrah. But first I wanted to check out the street vendors right in front of the hotel, vendors that I had heretofore been too busy to visit, despite becoming enamored with the wooden sculptures and such I kept seeing every time we drove by them. So I begin our tour here. I was really fascinated with the wood sculptures, both miniature and large, that seem to be a favorite artisan's livelihood in Haiti. Besides sculptures, many everyday utilitarian objects are carved of wood on the island. Now Andre went back to the car and we took off on one last winding, two-hour trip through chaotic downtown Port-au-Prince. A not atypical sight on the street corners, piles of tires. We stopped here for gas, ruins but a few feet away. You don't even want to imagine what might have happened to anyone who was in this car when the earthquake struck. Many cars are still flattened and entombed under concrete slabs and rubble WITH their drivers.